The recipe is from my friend Gianna. 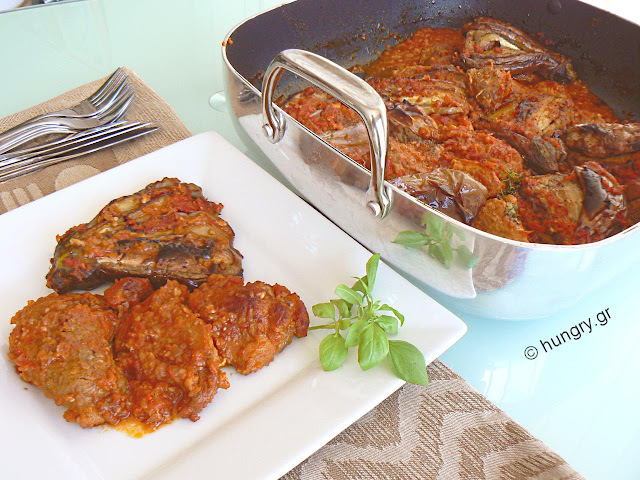 Excellent cook, with knowledge and experience more than of many professional. 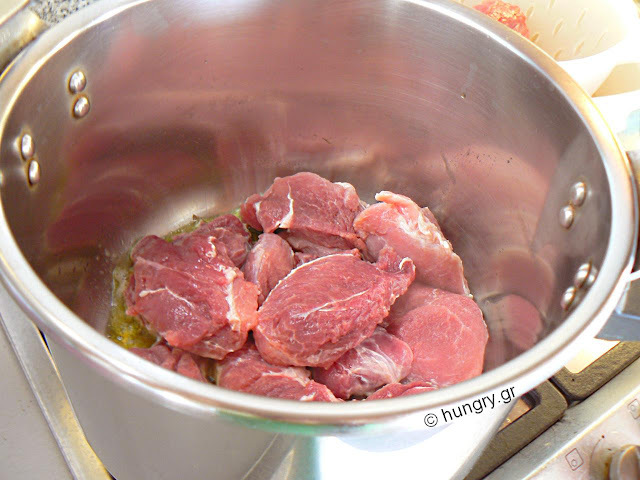 In a pot or pressure cooker put half the olive oil and sauté the meat to shield. Stir 2-3 times to saute well everywhere. 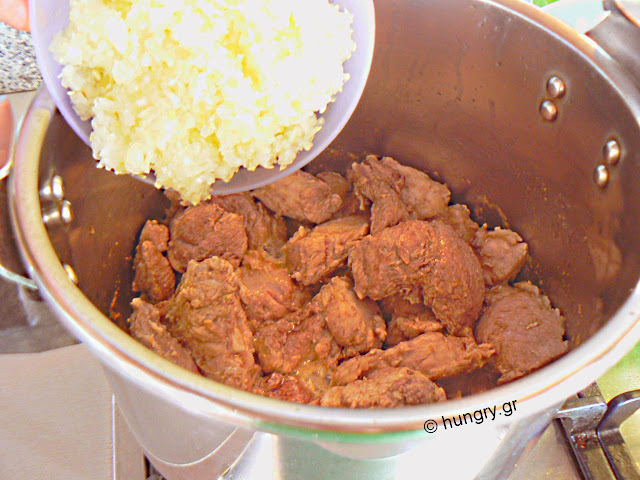 Puree the onions and garlic and add to the pan with the meat. Leave them a little wilted and polish. 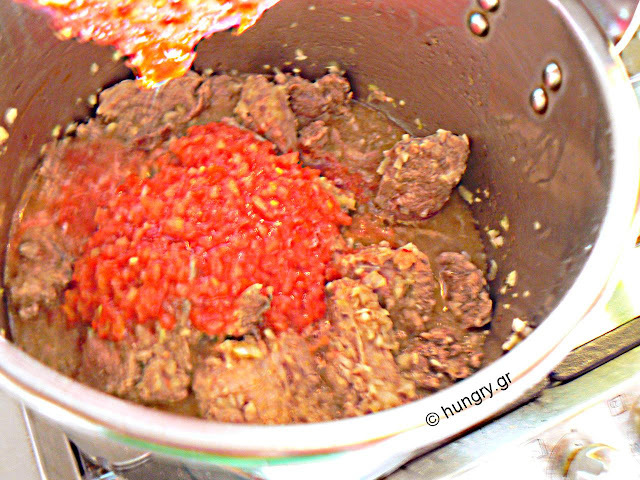 Muddle the fresh tomatoes and add to the food along with a glass of water. Close the pot and let the sauce cook until it's almost ready. In between wash and wipe the eggplant. You do not remove the stem. Cut only the edges that excess. 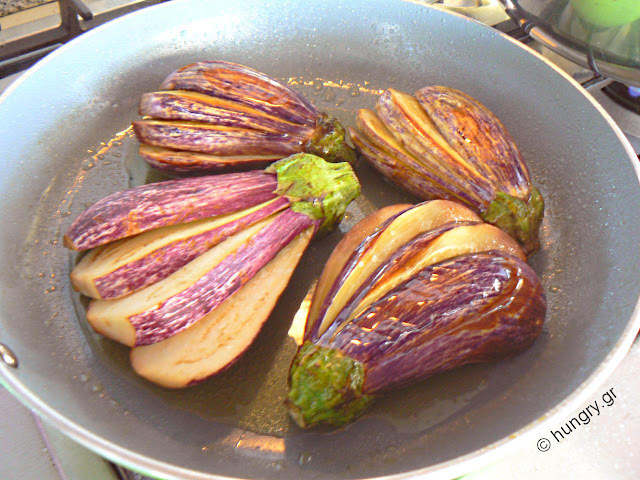 Pour the remaining olive oil in a nonstick pan, cut the eggplant into slices, to the point of the stem without separating them. Press with our palm to open. Salt them and fry lightly. 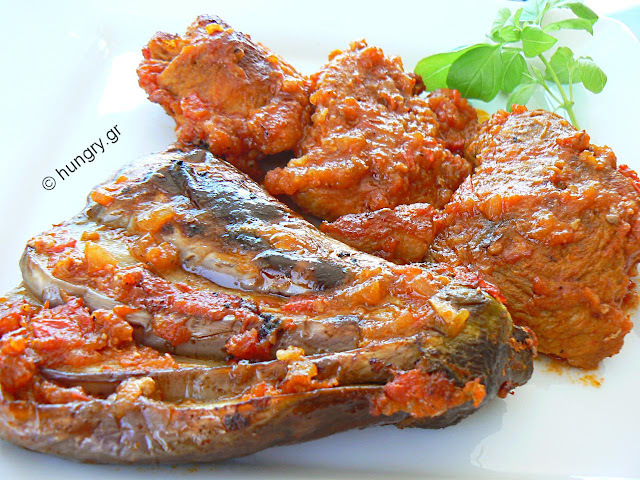 Spread in the oven pan the fried eggplant and put them between the cooked meat with the sauce. 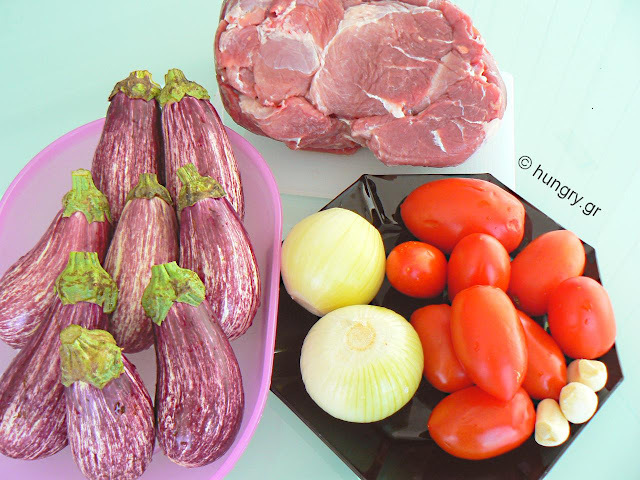 Add a little water and bake in the oven at 180 C for about 1 hour or until cooked eggplant, meat is very tender and the meat to stay with its oil. This dish was cooked and consumed, along with two friends loved the days of high temperatures during the summer, which is why the spices used were the slimeast to put. If you cook outside summer, then you can use whatever spices you like! This recipe, the Greek-and not only- moussaka is united with the French Vol-au-Vent and they give us a tasty matching pair. 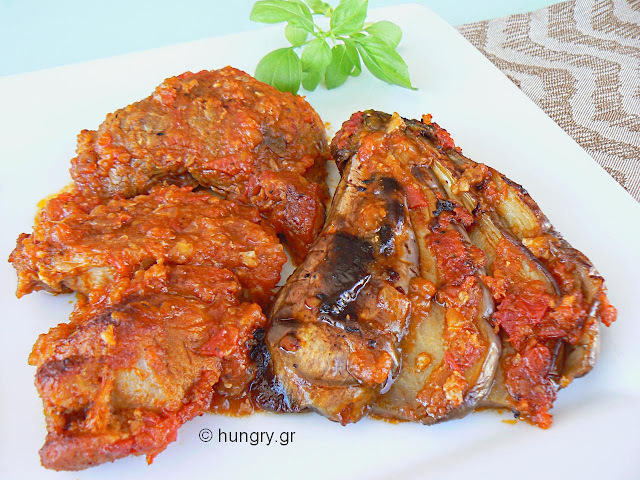 The flavor of the well known and loved moussaka, enclosed in crisp fluffy pastry. 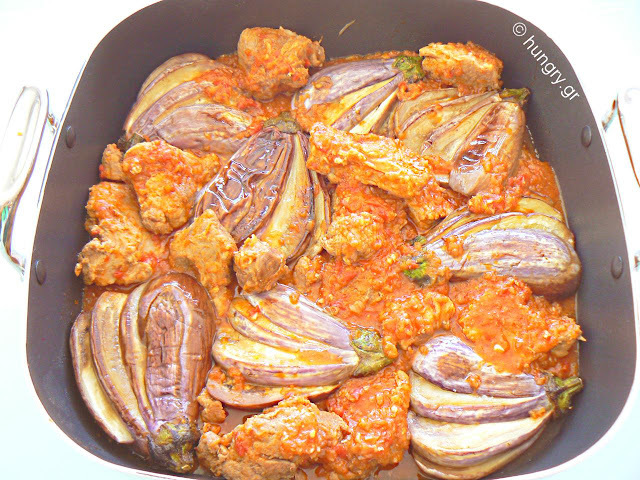 This dish requires more work than a simple moussaka but I think it is perfect for a formal buffet or meal. Heirloom beans look like small, colorful beads. They have a light pink to red or purple color with red spots on them. It's a delicious variety of beans, which we find in the market in the summer.